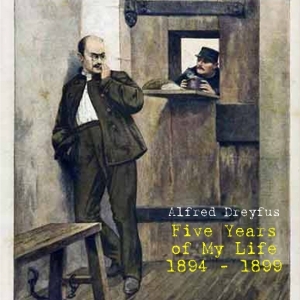 Alfred Dreyfus, a Jewish captain in the French Army was court martialed in 1894 on a trumped up charge of treason and condemned to life imprisonment on Devil’s island, a penal colony off French Guiana. His prison diary, published as Five Years of My Life in 1901 is a heroic tale of survival against daunting odds: isolation, deprivation, torture . . Alfred left behind in Paris his wife Lucie, who, forbidden to join her husband in exile, struggled to protect their two children from the rampant anti-Semitism that swirled about them, while she begged her husband to hold onto life as she tried to clear his name. Excerpts from the letters that Alfred and Lucie wrote to each other, between Devil’s island and Paris, are included in Five Years. Their letters are one of the great love stories of all times.